Cowboy Junkies appear at The Avalon Theatre in Easton on July 27 at 8 p.m. The Cowboy Junkies’ music is moody and often solemn, and this Canadian alt-country group is best known for its slow, stripped-down covers of classics by Bruce Springsteen, the Rolling Stones, Neil Young and Townes van Zandt, among others, sung in Margo Timmins’s ethereal smoke-and-honey voice. In 1988 the band scored a minor hit, its only one, with a reinterpretation of “Sweet Jane,” written by Lou Reed, from its second album, “The Trinity Session” (RCA), which went on to sell more than a million copies in the United States and two million in Canada. But while countless other 1980s bands have fizzled out or disappeared after far greater success, the Junkies still pack clubs throughout North America and Europe about 75 times a year, thanks to a cultish, Deadhead-like following that seems to surprise outsiders. With Cowboy Junkies’ new album, “All That Reckoning,” (releasing 13 days before their show in Easton) the band once again gently shakes the listener to wake up. Whether commenting on the fragile state of the world or on personal relationships, this new collection of songs encourages the listener to take notice. It also may be the most powerful album Cowboy Junkies have yet recorded. 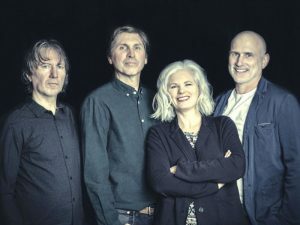 Cowboy Junkies appear at The Avalon on July 27 at 8 p.m. Tickets are available by calling Kimberly in the box office at 410-822-7299 or by ordering online at avalonfoundation.org.